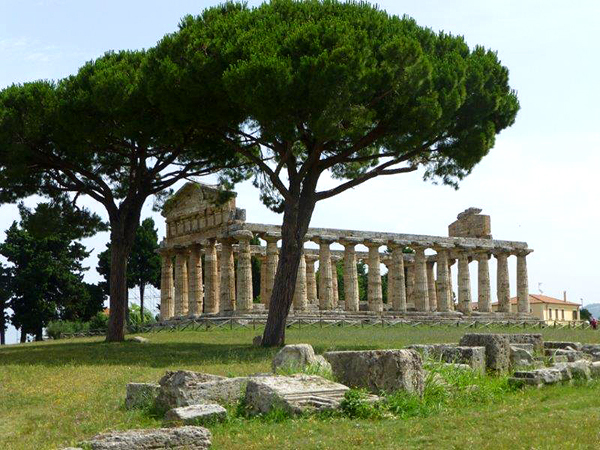 Spending a lot of time outdoors is a matter of course for Italians. Should you wish to get a feeling for and experience this Mediterranean way of life during your holidays, Villa Patrizia might be a great place to do just that. The ca. 3000 m² property offers well-tended outdoor areas, two roofed terraces at the house and, accessible from the outside, a sun terrace with wonderful sea view. In other words: you are sure to find your favorite spot there. 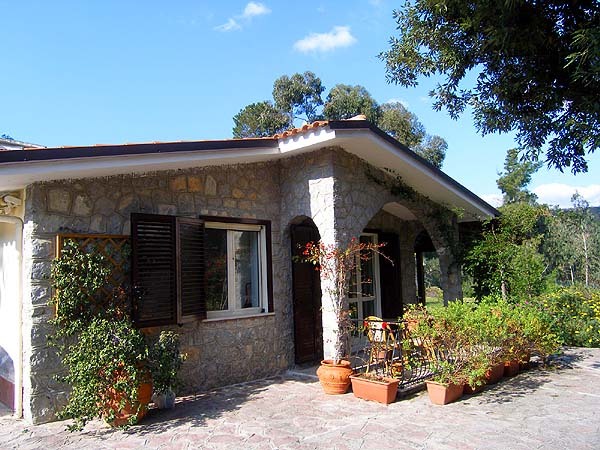 Villa Patrizia is located in the exclusive, green residential area (Zona Marcaneto) of Scario. The town center and the seaside promenade are quickly reached, be it on foot, by bike or by car. 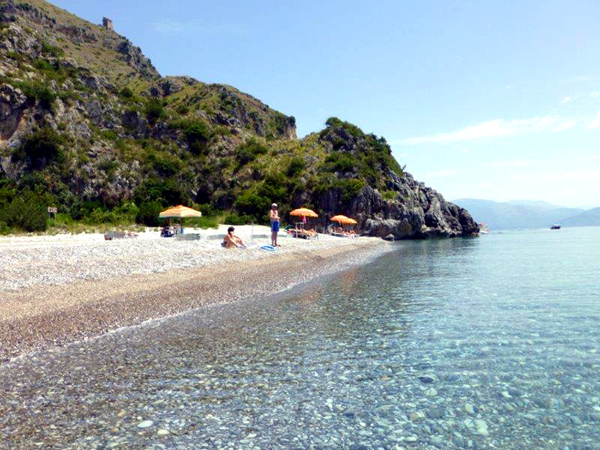 The beach (shingle) of Scario, for example, is ca. 600 m off. 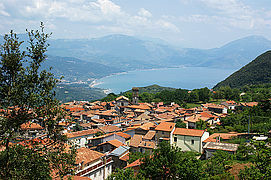 Small grocery stores, café-bars and restaurants are found in the center of Scario, ca. 500 m off. 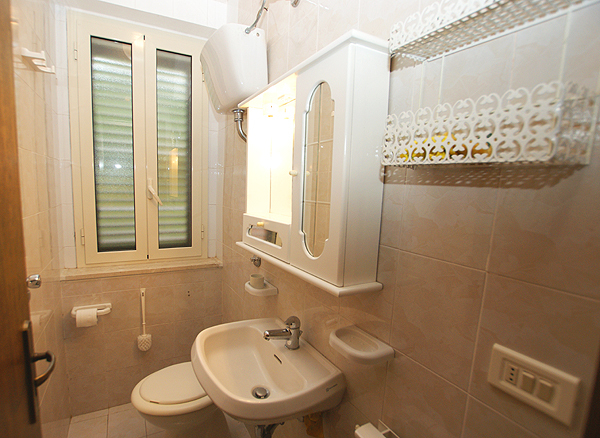 It is not only its great location, but also its "inner qualities" which make the holiday home so appealing. The rooms of Villa Patrizia are friendly and bright, their rustic style does in no way appear 'heavy'. 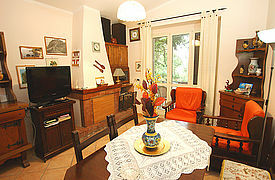 The living-dining room with TV and access of one of the roofed terraces is the heart of the one-storey house. Gather round the table with wooden corner bench at meal times or sit back in one of the chairs to read a book. During cooler seasons, you feel cozy with a fire crackling in the lovely fireplace. Upon entering you find yourself in the separate kitchen area, which is furnished, amongst others, with a gas stove, a microwave, a refrigerator with freezer compartment as well as a washing machine and offers access of the side terrace. 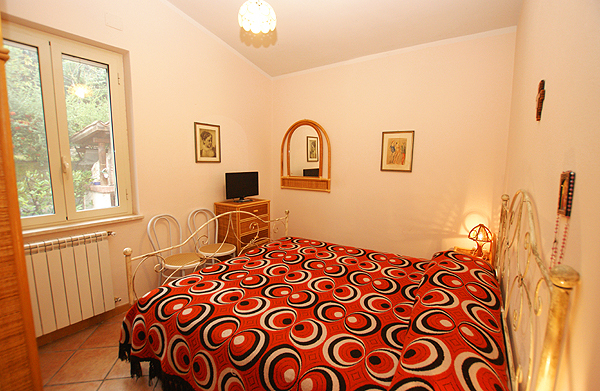 The two bedrooms in the back part of Villa Patrizia are furnished with a double bed each. There is a TV in one of the bedrooms. 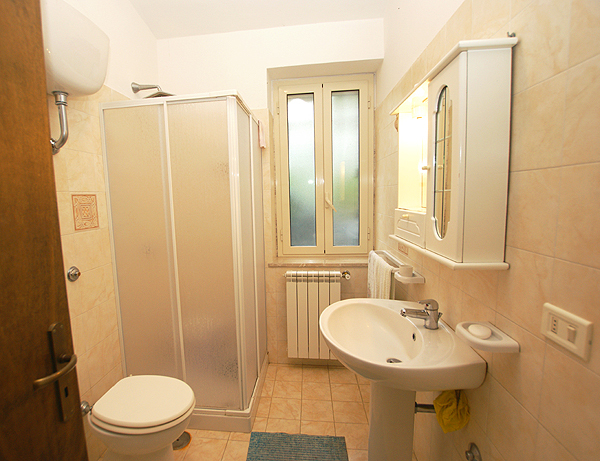 Villa Patrizia includes a bathroom with shower cabin, bidet and WC as well as an extra WC. 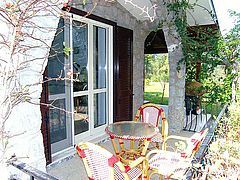 As the holiday home is furnished not only with a fireplace but also with central heating, it is absolutely suitable for a stay during the winter months. The outdoor shower in the completely fenced garden of Villa Patrizia is very convenient after returning from a day at the beach. 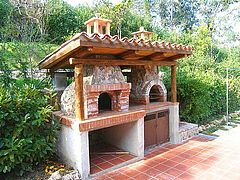 A brick-work grill with pizza oven is also at your disposal in the garden. Bigger shopping for your pizza evening or your grill party is best done at neighboring Sapri, where the weekly market usually takes place in the center on Friday morning. At San Giovanni a Piro, which is located above Scario, the weekly market takes place on Saturday morning. 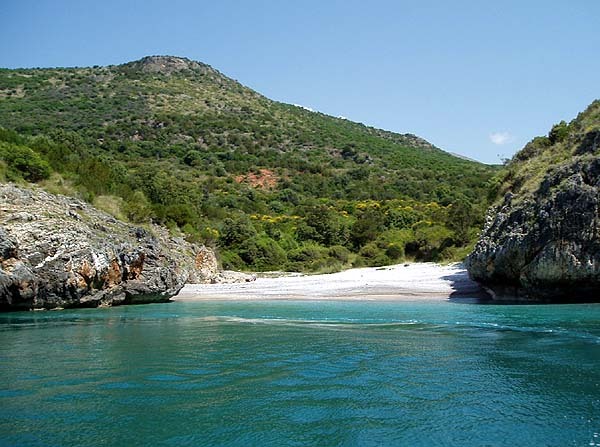 You should not stop by the small mountain village only to do some shopping, but also to enjoy the absolutely marvelous panoramic view of the Gulf of Policastro from there. 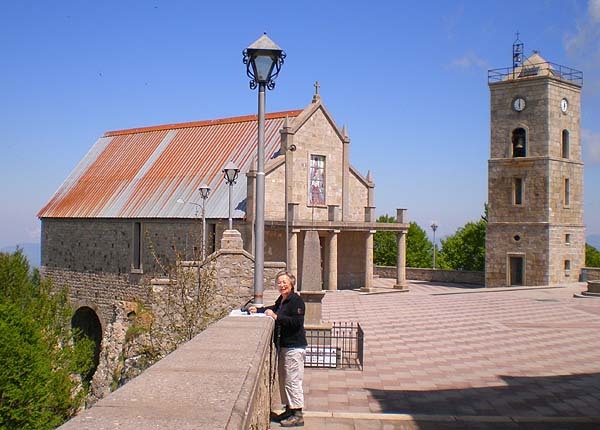 A hiking or a short e-bike tour and a stop at the village might be a wonderful idea. 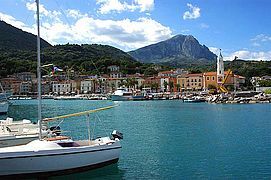 Bikes can be rented at Bicimania Moretti in Marina di Camerota. Holiday home Villa Patrizia accommodates up to four guests. 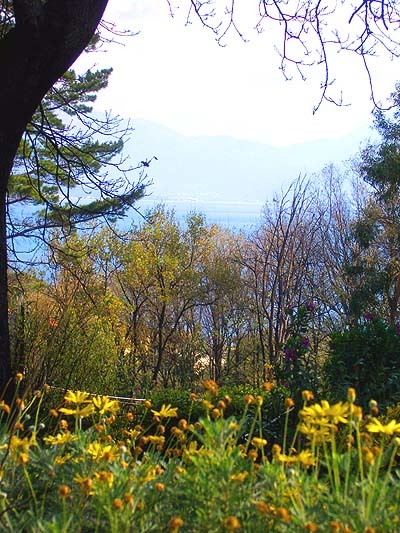 View of the sea from the garden. 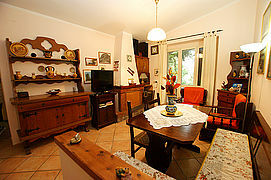 The living-dining-room with fireside and access of the roofed terrace. The sun terrace and the two roofed sitting areas at the house invite you to spend time outdoors. 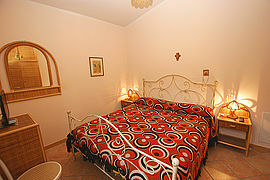 One of the two double bedrooms of Villa Patrizia. ...which is even furnished with a TV. The dining area with corner bench. The fireside provides for warmth and atmosphere. 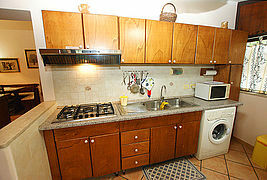 Upon entering you find yourself in the kitchen area with washing machine. Brick-work grill and pizza oven for preparing delicious Italian dishes. 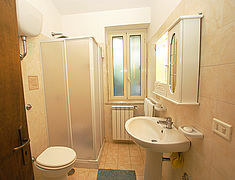 The bathroom of Villa Patrizia. There is also a separate WC at the holiday home. Scario's colorful seaside promenade. In the background Monte Bulgheria. 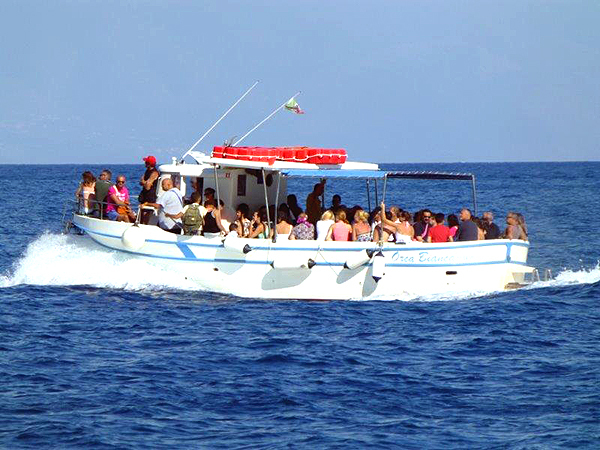 Our tip: a boat tour from Scario to solitary bays accessible only from the sea. 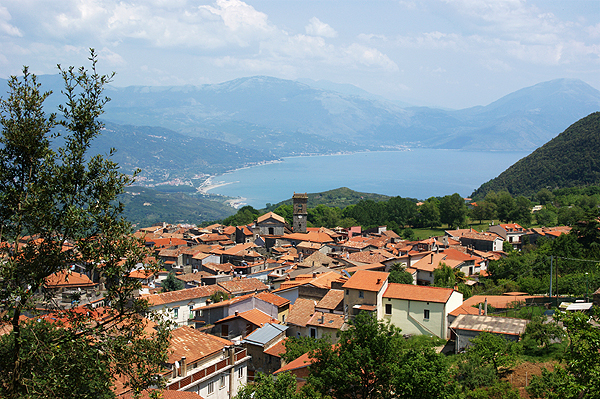 View across the rooftops of San Giovanni a Piro and onto the Gulf of Policastro. 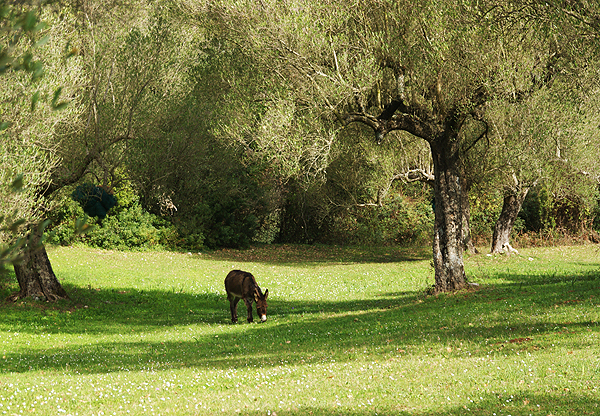 That's the Cilento, too: old olive groves, green meadows and donkeys, the latter often found in the mountain villages even today. Uns haben besonders die schöne, abwechslungsreiche Landschaft, die Berge und die Natur sowie die vielen tollen Wandermöglichkeiten begeistert. Außerdem haben wir die Ruhe sehr genossen und waren überrascht von der Freundlichkeit der Menschen. Man fühlt sich dort einfach willkommen. Die Villa Patrizia hat uns vor allem mit ihrer tollen, ruhigen Lage sowie der guten Zufahrt und Zugänglichkeit überzeugt. Was für uns ein unvergessliches Erlebnis war, war der Aufstieg auf den Monte Panormo in den Monti Alburni. Dort genießt man wirklich grandiose Ausblicke. Und auch die Grotta del Castelcivita ist definitiv einen Besuch wert. Alles in allem war unser Urlaub wunderschön. Jederzeit nochmal! 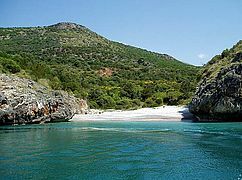 In unserem Urlaub im Cilento hat uns einfach alles gefallen. Die Region um Scario ist sehr schön, das Meer dort sehr sauber. Die Highlights des Ferienhauses waren für uns definitiv die großen und vielen Terrassen sowie die Außendusche. Jederzeit gerne wieder! Scario ist ein belebter, schöner und ursprünglicher italienischer Ort. Die Landschaft ist atemberaubend und wunderbar grün. Das Haus hat einen wunderschönen Garten, tolle Terrassen mit wunderbaren Ausblicken auf das Meer. Wir waren nicht zum letzten Mal hier! Prices are valid per week for the number of persons given in brackets and incl. bed linen, towels and final cleaning. Possible costs for heating (central heating, open fireside) are charged on the spot according to use.